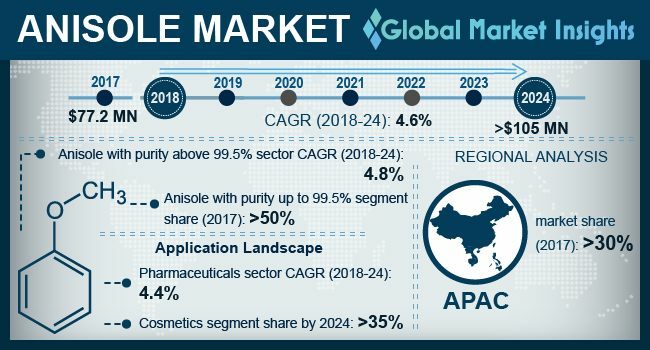 Anisole Market size will surpass USD 105 million by 2024; according to a new research report by Global Market Insights, Inc.
Anisole market growth will be ascribed to the upward trends particularly in the men cosmetics area of application by 2024. Men across the globe have been gradually indulging in beauty & personal care products. Demand for men-face washes and creams has increased manifold over the years. According to Personal Appearance Survey statistics by Euromonitor International, in the developed geographies, men are indulged in using beard shampoos, beard creams, lip balms and foundation. Besides, as more men involve in refining their appearance with enhanced grooming habits, it will be vital for manufacturers to create products aimed at male personal care, which in turn will present significant aspects for anisole in the cosmetics and personal care sector. The U.S. has been the most encouraging domestic environment for the commercialization and development of pharmaceuticals with the minimum industry barriers. The United States attracts the majority of global venture capital investments in start-up biopharmaceutical enterprises The U.S. healthcare spending increased 4.3% in 2016, thereby reaching about USD 10,348 per person, i.e. USD 3.3 trillion. The overall share of regional gross domestic product (GDP) related to health care spending was 17.9 % in 2016, up from 17.7% in 2015. Significant growth aspects in pharmaceutical sector will also propel anisole market size during the forecast timespan. Anisole with purity up to 99.5% was the popular segment in global methoxybenzene industry in 2017, with a market share above 50%. Leading industry participants for instance, Atul Ltd., Clean Science Inc., Westman Chemicals Pvt. Ltd., etc. have been involved in manufacturing anisole with purity up to 99.5%. Cosmetics area of application will have highest share surpassing 35% in global anisole (methoxybenzene) market. The product is used to produce fragrances, perfumes and various beauty care products to offer aromatic smell. Pharmaceuticals segment rise with CAGR 4.4% in anisole market by 2024. The product will have robust demand for its usage as a key precursor in manufacturing numerous pharma solutions. Asia Pacific led anisole market in 2017, with market share above 30%. The region has been a significant market for anisole in various personal care products and cosmetics. The growth was attributed to the enhanced discretionary expenditure, rising consumer preference to premium product investment and the imported personal products. Region will also mark substantial demand for anisole in pesticides with strong growth trends in the agricultural sector. For instance, China government has increasingly shifted its focus to reforming agriculture. Several government initiatives in India such as: ‘Paramparagat Krishi Vikas Yojana’, ‘Pradhan Mantri Fasal Bima Yojana’ etc. are aimed to propel the regional agricultural production in the next decade. Under India’s ‘Blue Revolution Vision’, the Indian government has invested around USD 470 million, with the aim to maintain an annual growth rate of 6-8% of the agriculture and allied sector. Few substantial manufacturers in methoxybenzene market include: Merck, Solvay SA, Atul Ltd., Huaian Depon Chemical Co., Oakwood Products, Inc., etc.